Eight UK airports are to roll out a network of 200 Bluetooth Low Energy beacons that will deliver notifications such as offers and rewards to passengers while they wait for their flights. The service is expected to be extended to other airports across the country in the future. 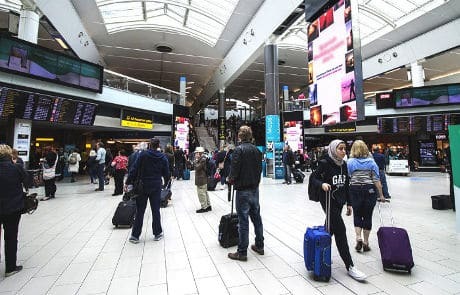 The project has been put in place by airport advertising network Eye Airports in partnership with mobile marketing and NFC specialist Proxama. It includes London Gatwick, Stansted, Bristol, Southampton, Inverness, Newcastle and East Midlands airports. “As the consumer chooses to receive these [location-based marketing] messages, they feel more involved in the communication process and, most importantly, can specify who they want to receive offers from,” says Sarah Parkes, managing director at Eye Airports. “Based on our experience, we have already seen a 24% click-through rate from our beacon deployments, which is higher than traditional forms of mobile marketing and much more targeted than email and geofencing,” adds Jon Worley, CEO of Proxama’s marketing division. Beacons open up a lot of possibilities, but you need the user to have a prepared app. How will they manage to communicate with users? Are they gonna develop an special app for this purpose?